The migration of components from packaging materials to foodstuff is certainly not a new consideration for packaging printers, brand owners and co-packers, but it continues to represent an area of global concern in terms of health and safety. As the broad base of packaging expands, and the printing processes for such packages also expand, it is becoming increasingly difficult to monitor and control the safety of food packaging print. The situation is even more complex due to the absence of a harmonized EU law for printing inks and commonly agreed methods for risk assessment. This is also true for printing inks that are UV/EB cured, although EuPIA and the Swiss Ordinance provide sound and recognized guidance for all types of printing inks and food packaging coatings. Pressure-sensitive and gummed labels, in-mold labels, flexible packaging and even direct-to-container print all represent considerably different routes to achieving the same end result, and all are used in the world of food packaging. 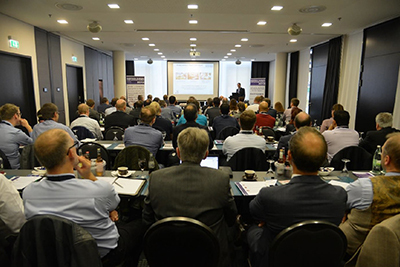 RadTech Europe’s biennial Food Packaging Seminar, held recently in Stuttgart, Germany, brought together an impressive audience representing the highly-complex supply chain – from raw material and ink suppliers and converters to brand owners – that represents today’s packaging print industry. RadTech Europe (RTE) has been focusing on food safety challenges and opportunities for several years and has an established reputation for factual reporting, as well as for thought leadership in this arena. This year’s seminar – introduced and moderated by RTE General-Secretary Mark Macaré and Paul Kelly of Univar Ltd – focused on how the entire food packaging value chain can benefit from the fast-curing and low-VOC print offered by UV/EB and UV LED technologies. The agenda combined lively expert presentations with panel discussions and Q and A sessions with delegates. As Manfred Hoffmann of Amcor Flexibles EMEA commented: “Product safety is about proactive risk management,” especially for packaging converters, he went on to show how this is achieved by his company in an active in-depth programme of analysis and process control of UV- and EB-curable systems which must, at the same time, take into account the supply chain security, the very low migration limits of acrylates and initiators and, of course, the new printing technologies. Of course, it is the brand owner’s first and foremost responsibility to ensure food safety. With an overall brief to manage Nestlé’s multidisciplinary approach to food packaging safety within the company’s extensive product portfolio, Dr. Amaury Patin from Nestlé’s Swiss research center enlightened seminar participants on Nestlé’s comprehensive system. With over 2,000 products – all packaged in printed packaging – and over 400 factories in 85 countries, the need for in-depth analysis and control of quality – both quantitative (e.g. in migration) and qualitative (in respect of compliance with established standards and regulations) – is, he said, paramount. It is also costly, and challenging. The lack of international and harmonized regulations and the complex and “often fragile” supply chains led Nestlé to create its standards for materials in contact with foods. This standard includes the Nestlé Guidance Note on Packaging Inks, which is updated every two years. Today, this Nestle Guidance is almost the handbook on guidance for producers of food-safe packaging. Nestlé is also committed to eliminating non-recyclable plastics and unsustainable packaging material combinations in order to achieve 100% recyclable or reusable packaging by 2025. Dr. Martin Klatt, of BASF and RTE HSE chairman, went on to provide an overview of developments in European food contact legislation. With the current lack of a harmonized legislation on printing inks, he advised the audience to depend upon the EC Framework Regulation 1935/2004 and the Good Manufacturing Regulation EC 2023/2006. In addition, he advised to use the Swiss Ordinance, the EuPIA guidelines for printing inks; and the voluntary stewardship guidance documents of major brand owners such as Nestlé. He added that Cefic and the FCA provide valuable risk assessment guidelines including modern tools such as the concept of “Threshold of Toxicological Concern” (TTC). These help manufacturers, and downstream users of food contact materials in the packaging value chain to undertake the necessary, and often complex, component testing and risk assessments. This helpful overview was followed by an outline of the position of the Packaging Ink Joint Industry Task Force (PIJITF) on planned EU measures on printed food contact materials. Dr. Nick Ivory of Sun Chemical, and chairman of the EuPIA energy curing work group, sketched the involved and inharmonious current industry regulatory situation. The PIJITF represents the entire value chain from ink raw material manufacturers to food business operators – an impressive compilation of leading suppliers within the broad packaging industry. The Task Force proposal for a regulation in relation to printing ink layers – including those on plastic food contact materials – whether directly in contact with food or not, represents an opportunity to achieve swift implementation of a system that meets current best practice and regulation, and ensures that substance migration limits are based on toxicological evaluation rather than simply on default limits. At the very heart of that changing and developing print technology base is the flexo process and, as Federico d’Annunzio showed, it is a process that has enthusiastically embraced radiation curing. As Bobst’s head of the flexible materials unit, he detailed the advantages of in-line narrow- and mid-web UV flexo across a wide spectrum of packaging types, from linerless, glue-applied and pressure-sensitive labels to cartons, stand-up pouches and sleeve labels. 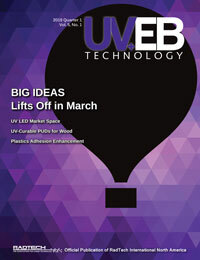 UV digital flexo technology is the latest pressroom development, combining higher productivity with the help of LED lamps with the ease of maintenance and safety of EB lamps. D’Annunzio defined the “digital flexo revolution” as a winning combination of UV flexo with digital automation and, of course, the benefits of extended colour gamut. With a selection of case histories, he underlined the versatility of the process and ended his presentation with an interesting comparison of the similarities and differences of digital flexo and straight digital print. The agenda moved into the digital arena with a holistic approach to UV inkjet from Steve Knight of Digital Direct Technologies. For the inkjet process, he said, “different technical and scientific disciplines communicate with different vocabulary;” and these processes range from physics and chemistry to engineering, electronics, software, surface science and application technology, and he explored in depth the requirements for achieving full ink cure, from software to printhead calibration, that are the recipe for quality, consistent results. Jonathan Sexton, chair of the UVFoodSafe steering committee, introduced the program and the two start-up work groups, which span process and print. UVFoodSafe is actively recruiting members for these work groups across the industry supply chain – and the RadTech Europe seminar was an opportunity to interest participants across the value chain. Member organizations already include major press, inks, and lamp systems manufacturers, material manufacturers and converters, as well as FINAT and RadTech Europe – but, to move into serious concrete actions, more participants willing to contribute time to this worthy initiative are still needed. The initial objective is to quantify and communicate deliverables in time for and Labelexpo 2019. Seminar participants then had the opportunity to enjoy an early evening networking session and mull over the seminar’s overall message – that radiation curing has much to contribute to food-safe packaging and labeling, and that the industry value chain is working to prove it and to strengthen the overall legislative base related to contamination of food-related print. To learn more, visit www.radtech-europe.com.